Chinese gold standard. The giant new smartphone from the Far East not only tries to impress with size and weight but also with features that are decent for the price of about 130 Euros (~$145). We ask ourselves where the Chinese took shortcuts this time. 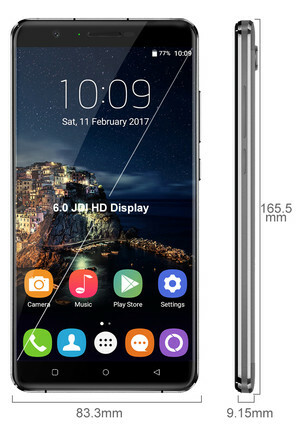 If you are in the market for a large screen device, only then you might want to consider the Oukitel U16 Max. There is nothing in it that you won't find in a regular sized smartphone apart from the big screen. From a general point of view, it does some things well and some really poor, and users looking for a large device might have to decide based on their budget and expectations whether to go for this device. Positive: Large screen; low price; nice display; metal case; fast fingerprint reader; decent cameras. Positive: Good price; nice display; great built quality. Negative: Poor cameras; heavy; low performance. Model: Oukitel has just announced a brand-new, bargain-priced mid-range smartphone, which is the U16 Max. It was announced at Mobile World Congress in Barcelona, and it definitely turned quite a few heads. Largely because it has that impressive 4,000 mAh battery inside, which should keep the U16 Max going for quite some time. It is still a rather mid-range smartphone with a large screen. Under the hood, the Oukitel U16 Max is powered by the MediaTek MT6753 octa-core processor and that is paired with 3 GB of RAM and 32 GB of storage. There is also a microSD card slot included for those that need a bit more storage on their smartphone. The U16 Max is shipped with Android 7.0 Nougat. When it comes to sensors, there are proximity, light, accelerometer and a fingerprint sensors. There is no NFC included on the U16 Max, but there is a 3.5 mm headphone jack. Other connectivity options include Bluetooth, OTG support, Wi-Fi, GPS and FM Radio. The screen's resolution is 720 x 1280 pixels, which translates to 245 pixels per inch when stretched across the massive, 6-inch diagonal. The advantage here is that users will be able to fit more content onto the screen, after all, that is the major reason behind getting a phone with a larger screen. The display here is not perfect, but it is definitely usable. It is also good to see that there isn’t any light bleed coming from the top, bottom or sides of the display. Seeing a fingerprint sensor coming on more and more of these inexpensive smartphones is definitely nice to see. However, one of the downsides is that these fingerprint sensors are not always as accurate as they should be. Oukitel has incorporated a pretty good fingerprint sensor here, one that works quickly and is mostly accurate. In the camera department, there is a 13 MP sensor for the main snapper, with its individual pixels sized at 1.1 µm, and a lens aperture of f/2.0. On the front, there is a 5 MP selfie camera, with a slightly smaller f/2.2 aperture. Keeping with the stock Android approach here, there’s not much going for Oukitel in the camera app. That is both good and bad. It means that the user isn’t bombarded with a tonne of features that they’ll likely never use. But it also means that there are isn’t a lot of modes, such as manual mode. Oukitel's UI for this phone is a light re-skin of Android 7 Nougat. The icons all have their own, unique look, and a couple of minor features like gesture unlock, fingerprint-assigned apps, and screen record have been added to improve the user experience. Nougat's brand-new split screen is definitely welcome on the large, 6-inch screen. There is also a one-hand mode, which shrinks the screen to make it easier to use with a single thumb. The Oukitel U16 Max is a good phone for those who need a simple smartphone with a large screen. 72.76%: This rating is bad. Most notebooks are better rated. This is not a recommendation for purchase.